Figure 1. CT abdomen revealing a large complex 16 x 11 x 12cm right anterior cystic renal mass with a calcified rim abutting the right colon. A 64-year-old woman underwent a screening colonoscopy at the direction of her primary care physician. The colonoscopy revealed an infiltrative, polypoid, and ulcerated large non-obstructing mass in the mid ascending colon that was biopsy-proven to be a well to moderately differentiated invasive adenocarcinoma. She underwent staging cross sectional imaging that revealed an incidentally diagnosed 16 cm calcified cystic mass (Bosniak IV) arising from the anterior aspect of an atrophic right kidney abutting the right colon and no evidence of metastatic disease. On physical examination, she had a palpable mobile right upper quadrant. She elected to proceed with concurrent right open radical nephrectomy and a right hemicolectomy for definitive management. Pathologic evaluation revealed Stage III, pT3N1bMx, G2 colonic adenocarcinoma. Examination of the excised renal mass revealed a cystic hypernephroma of low malignant potential. 1. Bosniak MA. The use of the Bosniak classification system for renal cysts and cystic tumors. J Urol. 1997;157:1852-1853. 2. Israel GM, Bosniak MA. An update of the Bosniak renal cyst classification system. Urology. 2005;66:484-488. 3. Schoots IG, Zaccai K, Hunink MG, et al. Bosniak classification for complex renal cysts reevaluated: A systematic review. J Urol. 2017;198:12-21. 4. Ward RD, Tanaka H, Campbell SC, Remer EM. 2017 AUA renal mass and localized renal cancer guidelines: imaging implications. Radiographics. 2018;38:2021-2033. 5. Winters BR, Gore JL, Holt SK, et al. Cystic renal cell carcinoma carries an excellent prognosis regardless of tumor size. Urol Oncol 2015;33:505.e9-13. 6. Chandrasekar T, Ahmad AE, Fadaak K, et al. 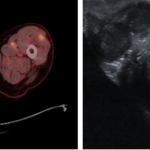 Natural history of complex renal cysts: Clinical evidence supporting active surveillance. J Urol. 2018;199:633-640.